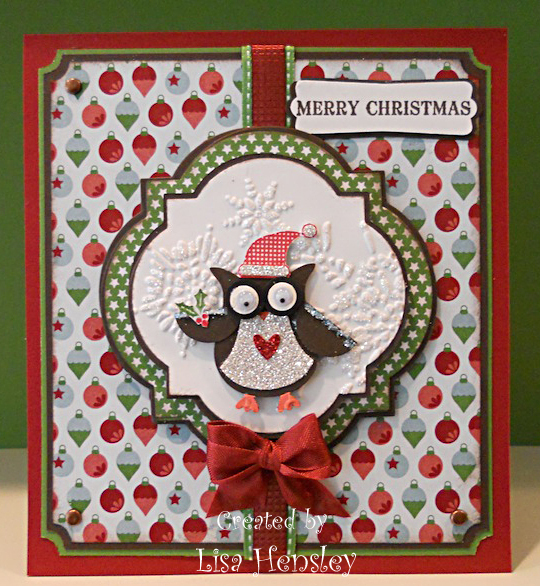 Here is an adorable little owl for one of this months' Creative Crew challenges! This month glitter, glam and glitz holidays are the theme. Anything that sparkles goes! I punched out the various pieces of the owl using the Owl punch. His little shirt-front and heart were punched from Silver and Red Glimmer paper and his wings, punched out using the 3/4" Circle punch and cut in half, have Dazzling Diamonds glitter on the edges. The white background was run through the Big Shot using the Northern Flurry folder, then picked out with more Dazzling Diamonds glitter. Mr. Owl's hat and bunch of holly was from the Owl Occasions set. I cut tiny pieces of Silver Glimmer paper to fit the trim on the hat to add extra bling. All products used were SU!, unless otherwise noted.